Today's post is a Guest Post after a long time. 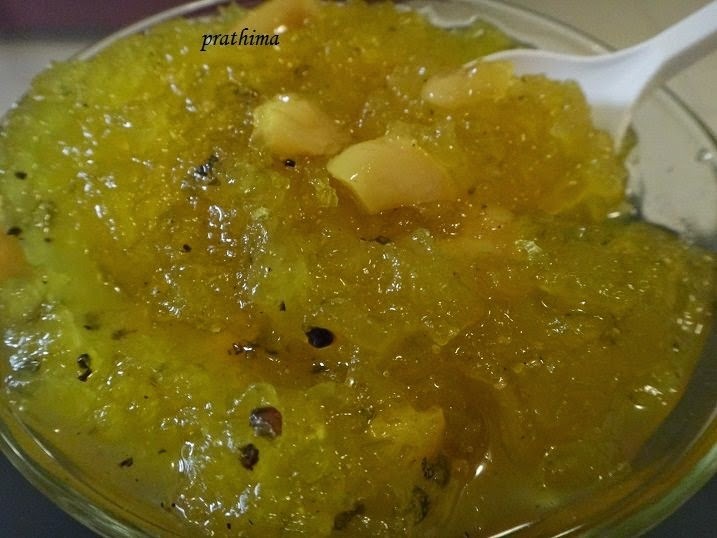 The contributor is my friend, Prathima Bhandary, who presents a dessert called, "Kashi Halwa" which is very popular in the Udupi-Mangaluru region of Karnataka. This dish is delicious and I am sure you will like it. It is frequently served at our weddings and other functions. The main ingredient is ash gourd which we call Kuwale, in Konkani, (Boodhkumbalkayi in Kannada and Petha Kaddu in Hindi). Cook the grated ash gourd in a pan. There is no need to add water as the ash gourd discharges water by itself. Cook till it becomes soft and is reduced to about 3/4 of its original quantity. Add the ghee and colour and mix well. Cook till the halwa leaves the sides of the pan.